In this example renders the MainPage component a div tag with some child components. You also see that it passes data to the header by assigning values to the attributes userAuthenticated and userName. Similar like we route url’s on server side to specific views we use a router on the client side to map specific urls to a view. Components are structured in an hierarchical way and they use two types of data to render the HTML. They received input data (accessed via this.props) from the parent component. And a component can also maintain internal state data (accessed via this.state). The differences are outlined in detail here. When the data of a component changes, the component is rendered again based on the updated data. Properties also support property validation to ensure the data is correct during development. To achieve high performance React recommends using a single immutable state with unidirectional data-flow to render your application. This is supported by the Flux architecture and the Redux library. API this is the back-end API used for authorization, documentation and real-time data of the vehicles written in ASP.NET Core. This API is accessible over HTTP and web-sockets. Service encapsulates the logic that calls the API or receives push messages from the API over web-sockets. This is a bit different as in most Redux examples but it seems more logic than placing the API calls in the Views or in the Action’s itself. This makes the Actions and Reducers only responsible for state changes. This also makes the the React Components lighter and easier testable because they don’t need to know about the action creators and the dispatcher. The Store holds the single immutable state. This state is composed out of multiple reducers each responsible for a part of the state. When the state is constructed or updated each reducer is called to get a part to the state. And these parts are combined into the single immutable application state. Reducers handle the actions and return the a new version of the state changed according to the received action. Component are are the main views of the application. These views are connected to the global store by the connect method. This ensure that the view is notified when the state has changed. When the state is changed the mapStateToProps() method is invoked. 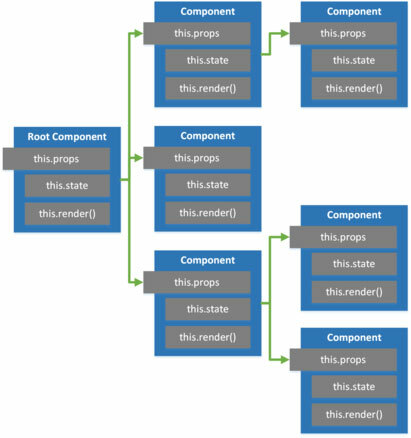 This method transforms the state into the data (props) necessary to render the component. Modules are now supported at language level by using the import and export statements. Classes and inheritance are now supported by a class and extends statements. Note that this is still prototype-based inheritance and that it is a different model in comparison to other class-based programming languages. Spread and rest operators (…). Spread and rest operators are used to split and combine arrays or objects. Especially the object spread operator is really powerful because it can be used to clone and extend objects. 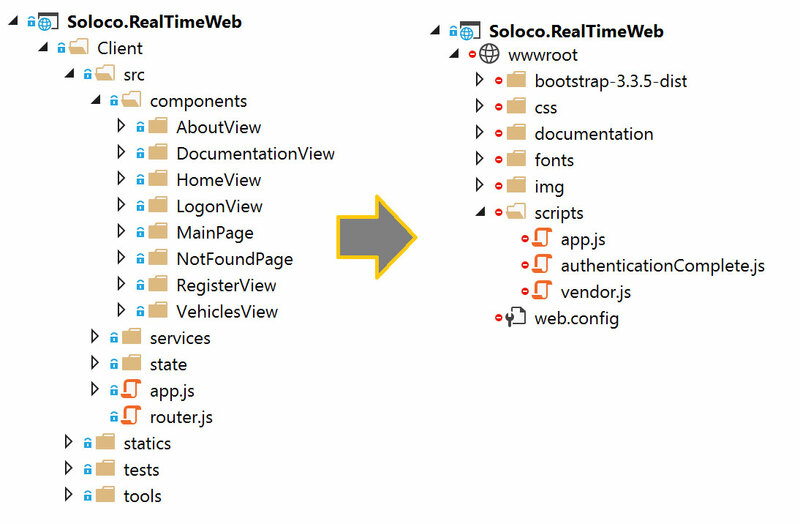 Browserify is used to combine libraries like React and Redux in a wwwroot/scripts/vendor.js file. This improve the build time of the app.js file drastically. It also improves the load time of the page because these much less frequently changed in comparison to the application files. Check out Client/tools/build.js for the full gulp script. Watch for changes in JS files and build instantly. This is the tool that you will keep open in a console window during development. While developing a React application I found these three kinds of tests really valuable. Testing of the actions and their effect on the state. Mapping of the state to component properties. Rendering of the component. For this we mock the called service by using __Rewire__. Currently this test only verifies that the view is rendered without any errors. While this is already valuable on it’s own, this test can (or should) be completed with assertions of the rendered view. In the next post I describe how I implemented authentication via OAuth for the React application.